This Healthy Homemade Sugar Free Maple Syrup tastes just like maple syrup, except it’s sugar free, low carb, and only 2 calories per tablespoon! Perfect for topping pancakes, waffles, oatmeal, yogurt, and more… the possibilities are endless! I’m the kind of person who likes to have dessert on a daily basis. It’s all I think about, breakfast, lunch, and dinner. I just want dessert. PLEASE, GIVE ME DESSERT AND NO ONE GETS HURT! Almost every night last week, I was struck with a serious craving for pancakes. And, as a true Canadian, the only way I can eat pancakes is with maple syrup (of course). I douse it alllll over my pancakes. While I love pure maple syrup — it’s wholesome, all natural, and even good for you (in moderation) — it’s still sugar. And, all that sugar before bedtime doesn’t sit well with me. Sugar makes me suuuper hyper (no one wants to see that…), so it makes it difficult for me to fall asleep. So, I made a solution — Healthy Homemade Sugar Free Maple Syrup! Yeah, I know this didn’t come pouring out of a maple tree, but just like pure maple syrup, this DIY version is all natural, fat free, gluten free, and vegan. It’s the perfect substitute for those who are also avoiding excess sugar, such as diabetics or those entering fitness competitions. This Homemade Sugar Free Maple Syrup tastes like pure maple syrup, just without the excess calories, carbs, and sugar. Soooo, what does that mean? PANCAKES FOR DINNER!!! Let’s all indulge in those beloved pancakes that we crave so much. Another reason why I love this Homemade Maple Syrup is because it’s great to pour over single-serving microwave cakes and ice cream. It’s even good when added to smoothies. This is a much better option than the sugar-free syrups on the market nowadays, which are filled with aspartame, artificial Splenda, artificial food coloring, artificial flavoring, and preservatives. No one wants that crap on their pancakes or in their body. Nope. I’d rather have my HEALTHY Homemade Sugar Free Maple Syrup which is sweetened with organic stevia extract instead of high-calorie white sugar or empty-calorie high-fructose corn syrup. 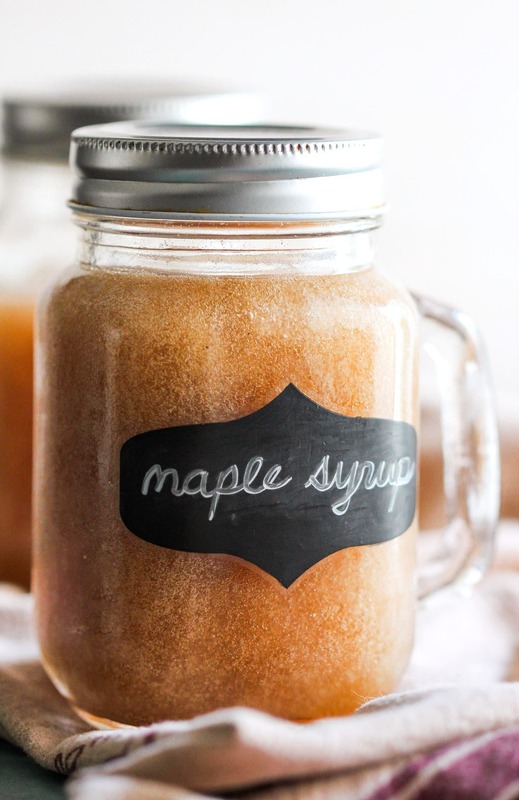 This Healthy Homemade Sugar Free Maple Syrup tastes just like maple syrup, except it's sugar free, low carb, and only 2 calories per tablespoon! Perfect for topping pancakes, waffles, oatmeal, yogurt, and more... the possibilities are endless! In a large blender (I used my Vitamix), add the water, maple flavor, and stevia. Blend on low speed. While the blender is running, remove the lid and slowly add the xanthan gum and salt. Once everything is incorporated and completely smooth, pour into pretty serving jars, tightly seal, and refrigerate overnight. Ready to use the next day! Refrigerate to store, and shake before using. Technically, this recipe contains 8 calories per ¼ cup serving but the label maker rounds it up. But seriously, 2 calories per tablespoon??? That’s like nothing. BRING ON THE [enter meal here]!! For me right now, that’s [PANCAKES]. Who knows, tomorrow it will probably be [OATMEAL] or [WAFFLES] or [SINGLE-SERVING CAKE]. Who wants to see this Healthy Homemade Sugar Free Maple Syrup in action? Also, how long can this be stored for? And does it taste the same if substituted in recipes for regular maple syrup? I have a bottle of sugar-free syrup but can’t bring myself to use it knowing what ingredients are in it! I’m so excited to make this!! I used all your recommended ingredients, it is frothy and white. Does the color change? Gorgeous pictures and that syrup sounds divine on EVERYTHING! 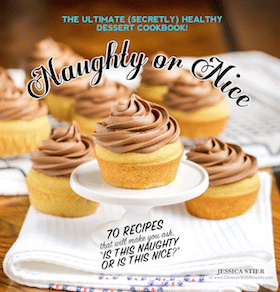 I love your creative recipes, Jessica! Is there something you could use instead of Xanthan Gum? I haven’t tried this either, but according to Wing it Vegan, it sure looks like it would work! Plus, those ingredients are easier to find. Hi, this looks so good! I have often ground up a 500 mg Vitamin C tablets with my mortar & pestle to add to cut apples, which helps keep them from turning brown. Since it’s ascorbic acid, I’m sure it’s worth a try. You can get ascorbic acid online from Puritan’s Pride. I use it all the time! Okay… I ordered the ingredients I didn’t have and made this last night. It’s delicious and totally works as a healthy substitute! I think next time I’ll add a little less stevia though as two tsp made it just a tad bitter, but still good! Could you use glucomannan instead of xantham gum? It is a healthy natural thickener and filler, and is used in LOTS of the Trim Healthy Mama recipes. I would also be using the pure powdered Nunaturals stevia, would it still be that much? Thanks, this sounds de-lish, and I am excited to try! I don’t have any experience with glucomannan so I can’t be sure, but from what I’ve read I’m sure it will work out just fine! does this taste like actual maple sryup? i have tried making homemade stuff in the past of it and wasnt a fan! I thought it did! But, it really depends on the maple flavoring you use. There are artificial ones out there that might taste too strong and “chemically” … and there might be some that taste watered down. Is there any downside to using glycerin- it seems to be the main ingredient in the maple flavoring. Of course it’s a great improvement over either real maple syrup or processed, but if this works for us my husband will be using lots of it!- so thought I’d ask. – newly sugar free. Hope you like the syrup! HI, I finally was able to make this, and it tasted really bitter. Do you have any suggestions on how to adjust the taste to be more sweet? Did you use Stevia in the Raw or liquid stevia? And if you used liquid stevia, what brand? Some brands have alcohol in it (I have no idea why, because it tastes terrible), and some brands are just plain horrible. Also, did you use natural maple flavor or artificial? Sometimes that can make or break a recipe. Thanks for the response! I used SweetLeaf SteviaClear Liquid Stevia, vanilla. I also used artificial maple. Should I maybe use less stevia next time? Wow, I’m surprised SweetLeaf’s vanilla stevia was bitter! I’ve never had that experience with mine. Maybe reduce the amount a little bit, to 1+1/4 or 1+1/2 tsp. I would also recommend using natural maple flavor, like the one linked to in the recipe. If you used McCormick’s artificial maple, it contains alcohol and sulfiting agents, which may have caused the bitter taste. I hope this helps! Hi there! I just made your recipe, (thanks for posting) and I halfed it. I am knew to this and wondered, if that made the nutrition panel half for the 1/4 cup since the servings were less? Would it still be 3g Carbs for 1/4 cup? My son is on the LGIT diet for epilepsy and this helps him enjoy foods that he used to enjoy. Thank you thank you thank you for making a little boys sacrifice easier! Hi! I really want to make this recipe and just wondered if i could use erthylitol instead of stevia? I haven’t tried this recipe using erythritol instead of stevia so I can’t be sure. I’m afraid the erythritol might crystallize, especially in the fridge, so I wouldn’t recommend it. Hope you like the recipe! so nobody has asked about splenda as a substitute for stevia… since i’m looking for something low glycemic, i’d be having to get sucralose drops. i use splenda all the time, (usually in powdered form though), and i’m not at all familiar with the flavor of stevia. can you think of any reason why splenda wouldn’t be a good option? I used to use Splenda a lot before I started eating healthier, but when I turned to Stevia in the Raw I actually came to like the flavor way more! Like you said, it can take a while for a person to get used to the taste of stevia or it will taste bitter at first. That may be something you could ask when people say it tasted bitter. The amount for this syrup is likely more than someone would use in coffee or tea. LOL, it seems like stevia is a flavor that people always describe as ‘getting used to’… kinda like ‘developing a taste’ for beer or something 😉 i generally don’t put my taste buds through the torture of learning to like something! but yeah, i do understand the caution surrounding splenda, but i’ll probably never give it up… so today i’ll go shopping for liquid splenda and xanthan gum. never used that before either! Could you heat it up? I love warm syrup over pancakes. I wouldn’t recommend microwaving it, in case that might change the flavor. I would recommend heating the syrup on the stove over low heat. Thanks for the recipe! I’ve been trying to find healthy syrups but can’t find any. Can the maple be an extract from walmart? I’ve never used maple extract from Walmart so I can’t be sure. If it has alcohol in it I wouldn’t recommend it. I’m sorry, I don’t have any experience with glucomannan so I can’t be sure… though, if you use to as a thickener to make syrups and gravies, I’m sure it’ll work here! I tried googling it but didn’t have much luck in finding the answer. Some say glucomannan and xanthan gum are interchangeable. I hope that’s true! I am totally going to try that!😊 Great idea! Hi. I’m from England and use Truvia, a calorie free sweetner made from the Stevia Leaf. I’m assuming this is different from Stevia in the raw and Stevia Extract? would it not work? Yes, Truvia is different than Stevia in the Raw. Truvia is 2x sweeter than Stevia in the Raw, it’s heavier in weight and it’s in granulated form. Stevia in the Raw is light and in powdered form, so it dissolves easily. The stevia extract I use is liquid and 1 tsp of it has the sweetness of 1 cup of sugar or Stevia in the Raw. 1 tsp of stevia extract is as sweet as ~1/2 cup Truvia. I’m just wondering if you tried making the syrup with Truvia, and if so, how it turned out? Love your website by the way. Thanks again. Pingback: Apple Pie French Toast (E) | Pray. Work. Eat. Woohoo! This syrup is great! 🙂 I used 1/2-1 tsp pure stevia extract instead of the stevia in the raw. I am attempting to make a stevia sweetened pecan pie. Do you have any idea how this syrup would work for baking in a pie? What is maple flavor? Does it contain any additives of unhealthy ingredients? Maple flavor is just like vanilla extract, but maple-flavored instead! It is 100% natural and alcohol-free (ingredients: Glycerin, water, and natural flavors). Hope this helps! I tried making this with arrowroot powder, thinking it would come out the same. Overnight in the fridge it remained liquid and thin. I found my xantham gum, and added two tsp and whipped in in the vita mixer, and it whipped into a thick pudding! Im crossing my fingers and leaving it in the fridge to see what happens tomorrow. I used half truvia and half stevia and it turned out great! I heat it in the microwave and pour over thm waffles or pancakes! YUM! How could u make other flavors? Thanks Jessica! Thank you. (I am new to your website). Hi I was just wondering, does it have a bitter taste to it? Because ive used stevia in some recipes and it doesn’t really do a good job at substituting sugar because of the ending bitter taste :(. What brand of Stevia do you use the to make this? I made a batch of this and it worked great as a substitute for honey/maple syrup with to make homemade granola, and I loved it on sweet potatoes, too. And SALTED CARAMEL?? That’s genius! I want that on my pancakes ASAP! I am not a fan of Stevia and have been using Luo Han Guo (Monk fruit extract) as my sweetener of choice for tea but have not tried it in any recipes yet. Do you have any experience with Luo Han? Do you think I could sub it for Stevia extract? I have been trying to research how close the two products are sweetness wise in case I can just sub Luo Han for the liquid Stevia in the same amount. Thank you for all of your recipes! I have tried so many and love them! I made the halved version of this syrup. Thank you so much! Hello, what a great website! I’m wondering if I could use gelatin instead of xantham gum for this recipe? Thanks! I haven’t made this as syrup yet, it sounds and looks delicous. During my last physical in July my cholesterol was too high and I was told I am now diabetic. I was already on BP medication. Since that day i have made several changes to my eating habits and I have lost 25 lbs. (Was 210 lbs now185). Went in last week ( 3 months later) for new blood work and the results were that my cholesterol is now back within the acceptable range, I am in pre diabetic status and BP medication was cut in half. So to continue my healthy lifestyle I constantly visit sites like yours for alternatives to the high carb, sugar laden recipes that had me in the state I was. I just read an article in Celestesbest.com and it appears that konjac powder can be substituted as a healthier thickening agent than xanthan gum for baking. But your syrup recipe doesn’t require coking and i wanted to know if konjac powder was a viable substitute. Also I would like to thank you for creating your site promoting healthy living. Wow, what an inspirational story you have Leon! Congrats on your incredible weight loss and 3-month turnaround! Amazing. I wish you the best with your health and happiness! Hello, mine doesn’t taste maple at all and I kept putting more and more. Any ideas? I added about 3 Tablespoons. I could try to add more. It is still in the fridge. I have not even blended it yet. Next time I will buy the brand you have. Thanks so much!! Hmmm that’s really strange. I’ve made this (and multiple readers have too) without any problems… what kind of maple flavor are you using? Hmmm… I’ve never used that maple flavor before so it could be a difference in the maple flavors we used. When you open the bottle, does it smell very strongly of maple? When I open my bottle of maple flavor it’s very potent and sweet smelling. How much of the flavor do you think you added? Maybe just add a bit more if it seems a little diluted? Hello! I just stumbled across your blog while searching for a stevia maple syrup recipe. Have you tried using the sweet leaf maple drops? I usually heat my syrup. Are you able to do that with this? Or will it lose its flavour? Do you mean you heat your syrup to cook it or you heat it to serve it warm? This syrup doesn’t need any cooking, but if you want to serve it warm, you can microwave it at 15 second intervals, stirring between each one, until it’s warm and smooth. I wouldn’t recommend boiling it. Hope you like the recipe! I modified this recipe to make a pomegranate-cherry syrup to go over a pot roast I made in the slow-cooker with pomegranate-cherry juice, a splash of white wine (leftover reisling), and minced onions, garlic and shallots that had been sautéed in toasted walnut oil. This I serve with spicy string beans in butter and a slice of low-carb soul bread from a recipe a friend found and posted to the book of the face. Cut all the numbers in half. I cannot eat a quart of syrup. Replaced water with pomegranate-cherry juice. Used a teaspoon of lemon crystals because lemon flavoring was not to be found. It’s ever so slightly bitter from the stevia, but the lemon really seems to mask that for everyone but me. 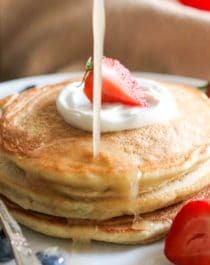 Next weekend I want to do brunch with pancakes and I’m going to try out your vanilla syrup recipe because I’ve been having dreams about it since I first stumbled across your blog. Hey Jessica! Awesome blog & post! I love stevia and am so excited to make this recipe. Thanks!!! How would you use swerve or sukrin instead of stevia? Hi! I really want to try this recipe out soon — was wondering if you ever have to blend it a second time after putting it into the container? I was thinking it would be a pain to always have to pour it out into a bender to re-puree every time if i don’t use it for a while. 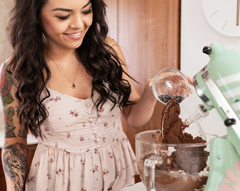 You don’t need to re-puree it, just give it a whisk or shake (I stored mine in mason jars so I could shake them whenever I wanted). This syrup doesn’t separate or anything. You litterally saved the day! 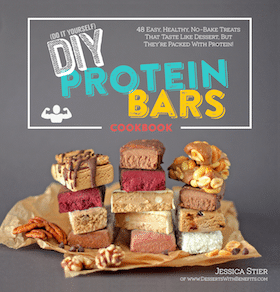 I was looking for a less sugary, sticky substitute to make granola bars and protein bars. I think this will be perfect! Just made your maple syrup and wondered how long will it keep in the fridge? Looks good, though, and smells wonderful. Super easy! Love it! Thank you for this recipe!! Mine seems rather thin, still. Not getting thick like it should. I used the Sweet Leaf Stevai and bought Xantham Gum. Thought I had all the right ingredients. Can I add more of the xantham gum to thicken it some? Not sure why yours didn’t thicken! Did you use less xanthan gum than what was stated in the recipe? Mine never has a problem thickening… I’d recommend adding more xanthan gum. But be careful, too much and it’ll be goopy! It seems fine now. Must not have waited long enough. Tastes really good!! How long will it keep in the fridge? From the looks of the feedback, this recipe must work REALLY well! I really want to try it now!